This beautifully illustrated and wonderfully written book is absolutely wonderful. Jazz is such a beautiful art form that is so hard to learn and play. It takes a certain kind of voice and kind of personality to pull off. As is writing poems about jazz, and Myers has mastered it beautifully. This book contains beautiful poems all about jazz and those who excel at it. Each poem is beautifully constructed to represent one of the most beautiful forms of music. They rhythm of the words match the rhythm of jazz. When you read it out loud, you can really hear the beat of the poem. 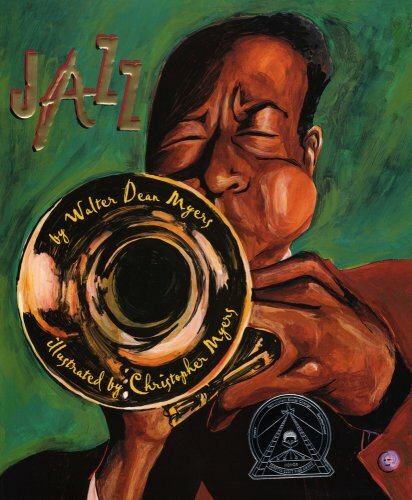 Paired with colorful illustrations and unique formatting, this book really gives you a feel for jazz, the style and the history. I also love that he included a glossary so that kids can go over the terms that they learned in this book, such as blues, chops, and melody. There is also a timeline at the end that talks about the history of jazz.